We love kids and believe it is important for their long-term health to give them a positive first experience in a dental office. We recommend seeing children at about the age of 3. If a parent or guardian had questions or concerns prior to this time, we would encourage you to call us. Research shows that early detection and good oral health care impacts their general health and can help improve their school readiness. 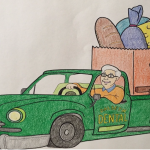 In addition, children benefit from early exposure to the dental office because it alleviates unnecessary future anxiety about the unknown and allows us to establish a relationship for the future. We will count their teeth, show them how to brush, and talk about how important it is to take care of their teeth. One of our dentists will also assess their oral health and can discuss with you any concerns with crowding, occlusion (bite), or risk of cavities to ensure they are developing appropriately. 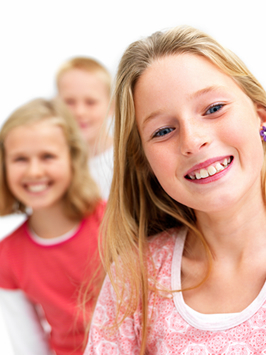 We recommend that kids have their teeth cleaned every six months. At that appointment, we will clean their teeth and remove any hardened calculus and plaque that may have formed, then we will use hand instruments and a state-of-the-art ultrasonic scaler to polish their teeth so they are bright and shiny. We also recommend a fluoride treatment to protect their teeth and keep them healthy and strong. Sealants can last up to 10 years, but since they are a thin plastic coating it is possible that they can chip or break off. Your dentist and hygienist will check them at your regular dental cleanings to make sure they are still in good shape. View the most recent guidelines set forth by the American Academy of Pediatric Dentistry or click here for additional information.